It is raining, and cold, and my house is desperately in need of some love and attention. I feel stuck, looking at all that could be done and should be done, and let’s be honest, the stuff that should have been done yesterday. And I just can’t summon up the energy. I manage (somehow) to manufacture small bursts of energy and start tackling a task. But before too long, I have been interrupted, or the energy dissipates, and then I find there are a bunch of half-finished tasks all over the house. Finally I beat myself up about it, because I am strong on good intentions but not on follow through. Truth is I am grieving. The loss of a much beloved grandfather. And it is okay to feel stuck in this place of grief. It is okay that the house is a mess, and the kids have had rice for dinner a few too many times this week. It is okay to pause and acknowledge the loss and pain. It is okay to just let some things go for a while. It is okay to acknowledge that something precious has been taken and I am sad, and right now I find it a little hard to focus on housework. 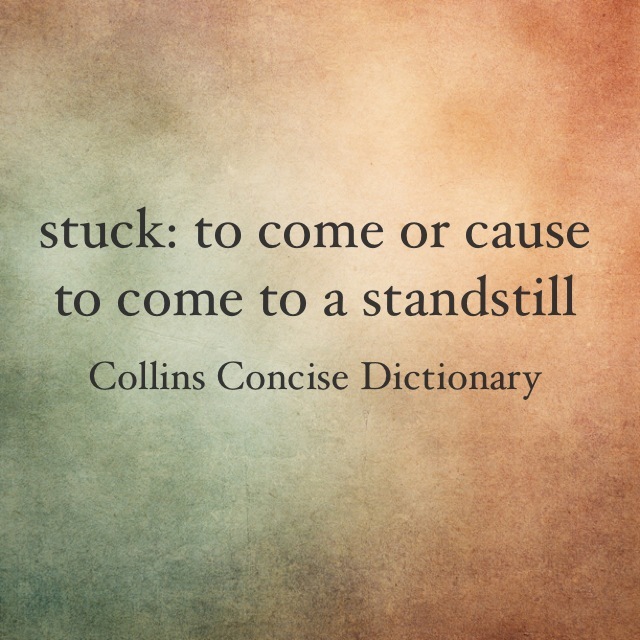 It is okay to be stuck for a while. Indeed it is. Email me in the future when you need a friend to stand along side?